Corinne and Rhet’s romantic waterfront Sarasota wedding featured a vintage and wistful theme with a neutral color palette of blush, champagne and gold. 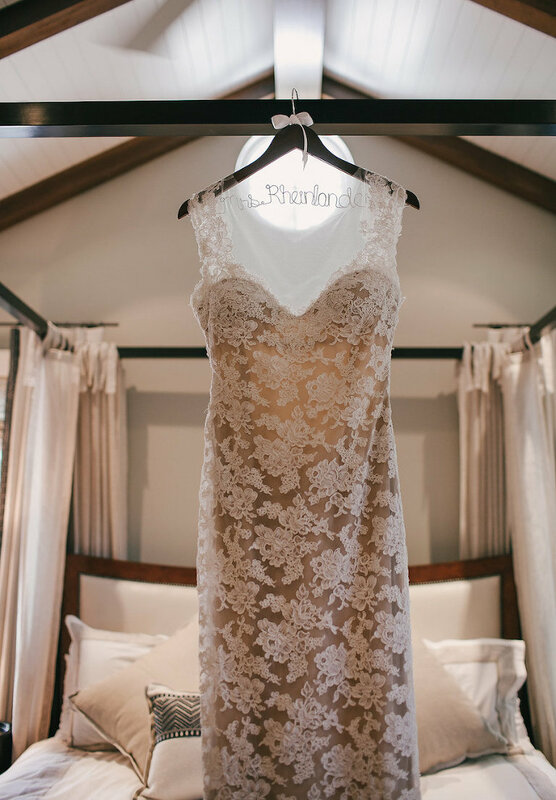 Keeping with her romantic theme, the bride selected a lace low back Reem Acra wedding gown from Sarasota bridal boutique Calvet Couture Bridal (formerly Blush Bridal Sarasota). 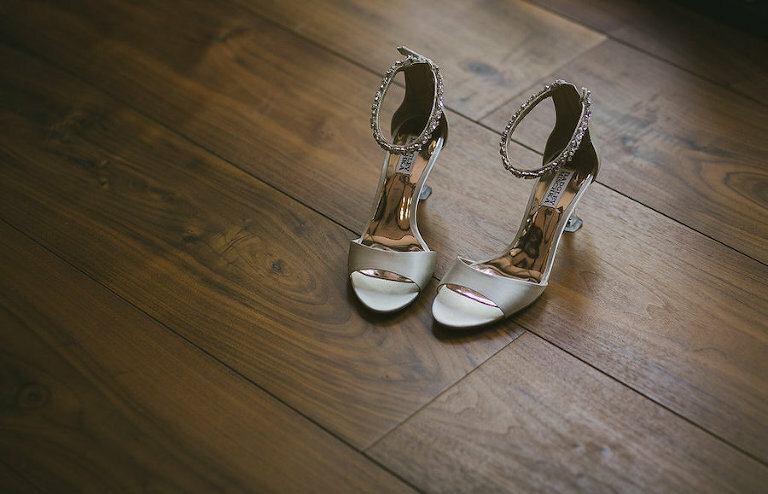 “Blush Bridal came highly recommended by a family friend. Their appointments are private so you and your family are the only ones in the shop while you’re trying on dresses. 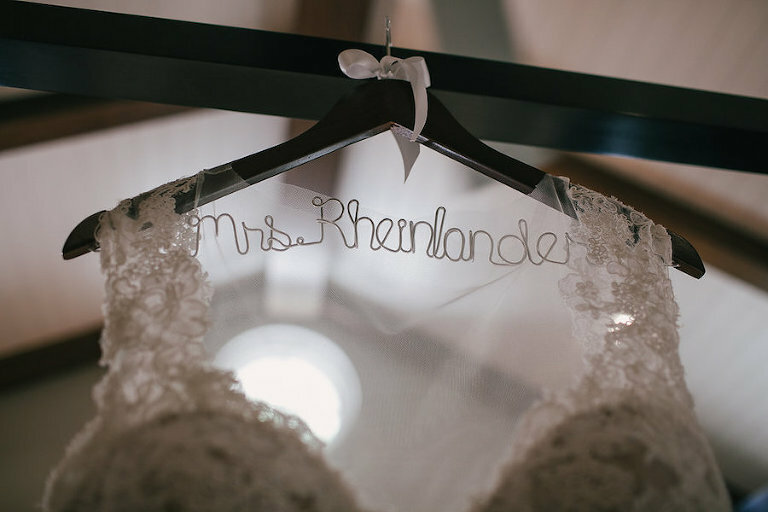 They truly make you feel very special,” Corrine gushed. The couple searched for a Sarasota wedding videographer who could capture the excitement and details of their wedding day. I researched many wedding videographers in the Sarasota and Tampa areas. I wanted a video that captured the emotional energy of the day and, for years to come, would bring tears to my eyes remembering how beautiful our wedding day was. I watched so many videos and once I saw James’ work with Imagery Wedding Films I was completely sold. I knew I had found the right man for the job! Imagery Wedding Films came highly recommended by my wedding planner, and once I video conferenced with James, it was a done deal. He was so friendly and professional. His work is incredible and we are so impressed! Vintage, wistful and romantic. I was inspired by my dress and the beautiful venue. Blush, champagne, taupe and gold. Rhet proposed at Marina Jacks in Sarasota after a family dinner. He had asked my dad’s permission earlier that day, and my brother was the first and only person to see the ring before I did. Rhet showed him on a dog walk and told him the plan to propose after dinner that night. The proposal itself took me completely by surprise, because although I knew he had gone to look at rings, he gave no inclination that he had one or would be proposing anytime soon. He surprised me with the most beautiful ring that he picked out himself!